Alexandria passenger and car ferry ticket prices, timetables, ticket reservations and information for ferries sailing from Alexandria to Venice. Compare all available Alexandria ferry ticket prices in real time and book the cheapest available Alexandria car and passenger ferry tickets sailing to and from Alexandria, Venice with Visemar ferries online with instant confirmation. 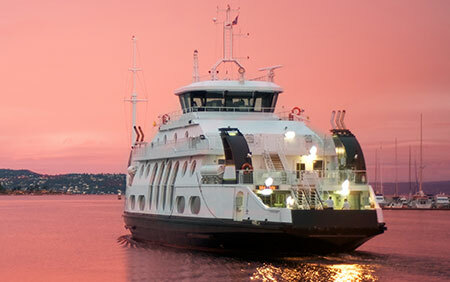 Book Alexandria Ferry Tickets with Visemar for ferries sailing from Alexandria to Venice online in advance to enjoy the cheapest available ferry ticket price. The price you see is the price you pay. There are no hidden extras or surprises such as added fuel surcharges or booking fees and we do not charge you anything extra for paying with a Visa Electron card. The price we quote you for your selected Alexandria passenger or car ferry ticket, onboard accommodation and vehicle type is all you will pay, and that's a promise. To obtain a Alexandria ferry ticket price and book your ferry ticket securely online please use the real time ferry booking form on the left. You are also able to add a hotel at your destination, or anywhere else, to your ferry ticket when completing your ferry ticket reservation. The second largest city in Egypt, Alexandria, known as "The Pearl of the Mediterranean", has an atmosphere that is more Mediterranean than Middle Eastern, its ambience and cultural heritage distance it from the rest of the country although it is actually only 225 km. from Cairo. Founded by Alexander the Great in 331 BC, Alexandria became the capital of Graeco-Roman Egypt, its status as a beacon of culture symbolized by Pharos, the legendary lighthouse that was one of the Seven Wonders of the World. Since the 19th century Alexandria has played a new role, as a focus for Egypt's commercial and maritime expansion. This Alexandria has been immortalized by writers such as E.M. Forster and Cavafy. Generations of immigrants from Greece, Italy and the Levant settled here and made the city synonymous with commerce, cosmopolitanism and bohemian culture, Lawrence Durrell described it as " The capital city of Asiatic Europe, if such a thing could exist". Founded in 332 B.C. by Alexander the Great, Alexandria was intended to supersede Naucratis (q.v.) as a Greek centre in Egypt, and to be the link between Macedonia and the rich Nile Valley. If such a city was to be on the Egyptian coast, there was only one possible site, behind the screen of the Pharos island and removed from the silt thrown out by Nile mouths. An Egyptian townlet, Rhacotis, already stood on the shore and was a resort of fishermen and pirates. Behind it (according to the Alexandrian treatise, known as pseudo-Callisthenes) were five native villages scattered along the strip between Lake Mareotis and the sea. Alexander occupied Pharos, and had a walled city marked out by Deinocrates on the mainland to include Rhacotis. A few months later he left Egypt for the East and never returned to his city, but his corpse was ultimately entombed there. His viceroy, Cleomenes, continued the creation of Alexandria. The Heptastadium, however, and the mainland quarters seem to have been mainly Ptolemaic work. Inheriting the trade of ruined Tyre and becoming the centre of the new commerce between Europe and the Arabian and Indian East, the city grew in less than a century to be larger than Carthage, and for some centuries more it had to acknowledge no superior but Rome. It was a centre not only of Hellenism but of Semitism, and the greatest Jewish city in the world. There the Septuagint was produced. The early Ptolemies kept it in order and fostered the development of its museum into the leading Greek university, but they were careful to maintain the distinction of its population into three nations, "Macedonian" (i.e. Greek), Jew and Egyptian. From this division arose much of the later turbulence which began to manifest itself under Ptolemy Philopater. A hybrid city dubbed the "Capital of Memory" by Durrell, ALEXANDRIA (El-Iskandariya in Arabic) turns its back on the rest of Egypt and faces the Mediterranean, as if contemplating its glorious past. One of the great cities of antiquity, Alex slumbered for 1300 years until it was revived by Mohammed Ali and transformed by Europeans, who gave the city its present shape and made it synonymous with cosmopolitanism and decadence. This era came to an end in the 1950s with the mass flight of non-Egyptians and a short-lived dose of revolutionary puritanism, but Alexandria's beaches, restaurants and breezy climate still attract hordes of Cairenes during the summer, while its jaded historical and literary mystique remains appealing to foreigners. Alex encourages nostalgia trips and random exploration, if only because the "sights" are limited and chance incidents often more revealing. Don't be afraid of following your nose and deviating from the usual itineraries, which could be completed in a day or so if you focus on the city's monumental highlights. The Roman Theatre and Villa of Birds at Kom el-Dikka and the spooky Catacombs of Kom es-Shoqafa are musts, as is the city's magnificent new library and Alexandria National Museum, exhibiting statues and other artefacts dredged from ancient cities on the seabed. If you also want to savour the ambience and literary mystique of the former European and "native" quarters, allow two or three days. Today, Alexandria is a bustling city of over 4 million (mostly Egyptian) residents. Alexandria has always been popular as a vacation destination for local Egyptians looking to escape the summer heat and enjoy the Mediterranean beaches. Foreign tourists are also discovering how easy it is to visit Alexandria for even just a day or two. Winter (December to February) is fairly warm and sunny in Alexandria although the sea will be too chilly to swim in comfortably. A warm, dusty wind (Khamsin) can be bothersome during March - June. Summer is humid, but with a breeze it stays a lot cooler than in Cairo and so many Egyptians will flock to Alexandria in the summer. Book your hotel well in advance if you're coming during the summer months. September - October is a very nice time to visit. Click here for today's weather in Alexandria. Fort Qaitbey is an impressive building, located on a narrow peninsula where one of the ancient wonders of the world, the famous lighthouse where the Pharos once stood. The Fort was built in the 15th century and now houses a naval museum. You'll need about an hour to explore the rooms and towers, as well as the museum which houses some interesting weapons. The Fort also offers beautiful views of the city of Alexandria as well as the Mediterranean. A small aquarium nearby is worth a peek. There are plans afoot to build a large underwater museum in the near future which would showcase some of the exciting recent archaeological discoveries. The Corniche is a road that runs along the eastern harbour of Alexandria and is the perfect place for a waterfront stroll. There are several restaurants where you can enjoy freshly caught fish. You'll pass some nice examples of Art Deco buildings like the (Sofitel) Cecil Hotel which has been enjoyed by Mohammed Ali (the boxer), Agatha Christie and Winston Churchill among others. A stroll down the Corniche also brings you to several of Alexandria's main attractions (some of which are described further below) like the Ramla square, Cavafi Museum, The Roman amphitheatre, the Attarine District (for shopping) and the Tahrir (liberation) Square. Treat yourself to a Brazilian coffee, a bubbly pipe or a hot glass of tea in some of Alexandria's wonderful cafes. The Attarine souk is a maize of little streets, too narrow for cars to fit, that houses literally hundreds of little antique shops and boutiques. It's called the Zinqat as-Sittat market (which literally translates to 'the women's squeeze'). You'll find some good deals to bargain for here. It's an uncovered bazaar so it's not as stuffy as others. Local young folks prefer the malls to the souqs these days, so if you're interested in modern Egyptian fashion, that's where you'll find it. Best Price Guarantee - We always offer you our lowest available Visemar passenger and car ferries ticket price to and from Alexandria. There are no hidden extras or surprises such as added fuel surcharges or booking fees and we also we do not charge you anything extra for paying with a Visa Electron card. The price we quote for your selected Alexandria ferry ticket, onboard accommodation and vehicle type is all you will pay, and that's a promise! In the unlikely event you find the same all inclusive Alexandria ferry ticket cheaper in the brochure of any other tour operator we promise that we will do our best to beat that price or offer you the choice of requesting a refund. To book Alexandria car and passenger ferry tickets please click here. At ferryto.co.uk you are able to obtain live Alexandria ferry ticket prices, check availability and book car and passenger ferry tickets to and from Alexandria at our lowest available ticket price. Ferryto.co.uk is part of the world's largest online ferry ticket distribution network providing the ability to book over 80 major European ferry operators including to Alexandria and to over 1,200 other ferry routes throughout the UK, France, Spain, Ireland, Holland, Eastern Europe, the Mediterranean, the Baltic and North Africa.